Most of us have already settled on one Android launcher for use, but that doesn’t mean that new ones won’t wow us. 9 Cards looks to “enhance your Android experience,” and it does so in an almost undoubtedly beautiful manner. The look, which reminds us a bit of what’s found in the Timely alarm clock app, presents the interface in an easy-to-use manner centered around collections of apps. 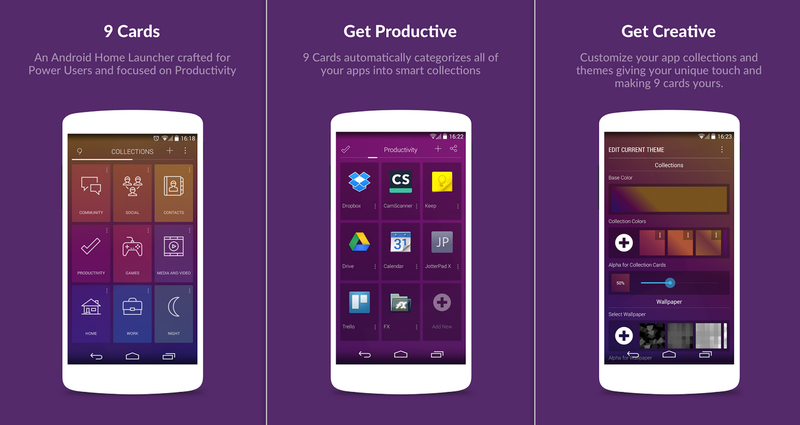 It takes information from how you use 9 Cards and your device, and intelligently sorts your apps into categories. The app uses a gesture-based system for navigation, which is simple to get the hang of, while the animations are nothing short of beautiful. Your apps are organized initially by the type of app they are — for example, my Communication category is filled with apps like Gmail, Skype, Hangouts, and EvolveSMS. Based on the time of day, 9 Cards can also provide you with apps you are likely about to use. If you end every day with a dose of Feedly and Twitter, you’ll be given shortcuts straight to those apps. Over time, the app will adapt to your usage patterns and should keep getting better and better. 9 Cards can also help you to discover new apps. Clicking “Add New” and swiping into Recommendations gave me apps like Firefox, Dolphin, Opera, and Kik, which makes sense because the last two apps I used after installing 9 Cards were Chrome and Hangouts. In case you wouldn’t leave your current launcher for your life, though, 9 Cards has a solution for you as well. On top of your current launcher, a gesture from the right hand side will take you straight into your collections to easily launch apps. 9 Cards is available on Google Play for free, with a Pro upgrade priced at $2.99. Absolutely be sure to check it out, and let us know what you think right down below. Update: As many have noted, this is not a traditional 3rd party launcher in the sense that you have all become accustomed to. That said, the developer is calling it a “Home Launcher,” so we are reporting it as such. It’s OK, trust me, it’s going to be OK.